ALIA, with the support of The City of Gold Coast Libraries, presents"Librarians and Dragons"! it can be used to support research or tell a story. As part of Library & Information Week the City of Karratha, in Partnership with the State Library of Western Australia, are holding a regional conference for East and West Pilbara Libraries. ALIA are supporting the event by connecting subject matter experts in a webinar session aimed at developing a library communications plan. ALIA and the Australian National Data Service (ANDS) are presenting an information session on the Australian National Data Service focussing on the delivery of relevant and high quality research data resources to the university, business and governmenr sectors. ALIA and ExLibris are proud to present a brand new event on the library and information calendar. Join us for the inaugural Leadership and Innovation Forum series across Australia. ALIA Training in partnership with ANDS are pleased to bring to ALIA members a FREE short workshop on data management - why, what and how. Suitable for ALL library types. In fact that's the point! All libraries have a role in making data more available, using data, and contributing to data; school, special, university, TAFE, government and public libraries should all be involved. With thanks to our hosts, Adelaide City Library. ALIA in partnership with the Australian National Data Service (ANDS) is holding short information sessions on the role libraries have in making data more available, using data and contributing to data repositories. All library sectors will find the seession of value: university, government, special, TAFE, school and public libraries. ALIA/ANDS Research Data Information Session - the Australian National Data Service (ANDS) in conjunction with ALIA are offering short information sessions on research data management. The focus is on the role libraries have to make data available, using data and contributing data. The information sessions are relevant to all library sectors: university, government, special, TAFE, school and public libraries. Ready and Prepared for Research Data! 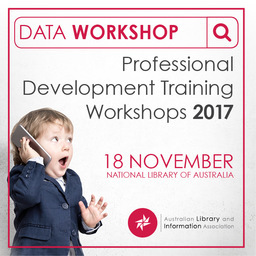 ALIA Training in partnership with the Australian National Data Service (ANDS) are pleased to offer a short workshop on data management - why, what and how! This short workshop is suitable for ALL library types. In fact that's the point! All libraries have a role in making data more available, using data, and contributing to data: school, special, university, TAFE, government and public libraries should all be involved.